Recently I needed to execute xUnit tests with MSBuild, so I've spent some time for creating a MSBuild project running the tests. Luckily xUnit already have MSBuild tasks so I just needed to hook it up. The tool get all the changes between revisions or to a revision of a local git repository and pass the commits to a Razor template which then outputs the result in a given file. The commits can be filtered by a given pat in the repository. You can find the tool on github here. Example usage(example.bat) and razor(example.razor) files inside the project folder. As in my recent work I had to deal with some configuration transformations from C# code I've created a nuget that can be used if you want to apply a transformation programmatically. To do that you can install the ConfigurationTransformation package from the official nuget repository. and then just create an instance of the ConfigTransformer class to apply the transformation. If you don't specify the destination file the source file content will be changed with the result transformated content. TransformHelper.exe -mode apply -source "C:\Work\MySolution\WebProject\web.config" -transformFile "C:\Work\MySolution\WebProject\web.Dev.config" -target "C:\Temp\result.web.config"
You can find the tool on github here. Sometimes I need to convert GUIDs without dashes to GUIDs with dashes or vice versa, so I've created this small page to help me with the conversion. Sometimes you want to build only a single project, or a list of projects from a solution without building the whole solution with MSBuild. To do so, you can use custom build targets. You need to add a custom build target for every project you want to build containing the relative path in solution structure of the project (.csproj/.vproj). Another thing you need to have in mind is that the dots(.) in the project name should be replaced with underscores(_). You can clean or rebuild adding :Clean, :Rebuild at the end of the target. However if you can check all the MSBuild targets used from the solution. As you may know, when running MSBuild command against a solution file in-memory it is converted to an actual MSBuild project named [SolutionName].sln.metaproj. You can add an environment variable named msbuildemitsolution and set its value to 1 and run MSBuild from command line. 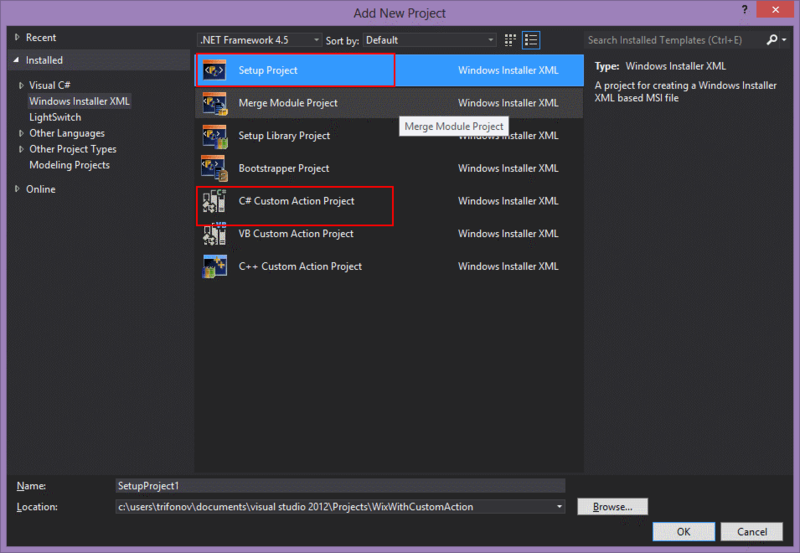 Another option is to add /p:msbuildemitsolution=1 to the passed parameters to the build. This will generate the .metaproj file where you can find all the needed targets. Lets illustrate all the above with a simple example. WIX is a great toolset for creating installers. In most of the cases when you need an installer you need some custom logic to be executed. It's great that WIX supports managed custom actions. Anyway it wasn't so easy for me to make it work, so I want to share my experience. 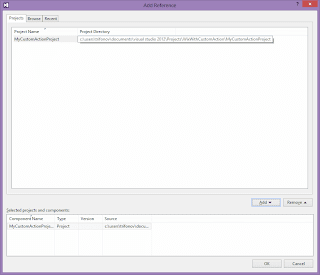 I will demonstrate it using the WIX Visual Studio add-in (version v3.7.1217.0). We will create WIX Setup project and C# Custom Action Project. We will add a dummy text file in the setup project to be used as installation content and will change a little bit the auto created Product.wxs file. If we build the WixWithCustomAction project, WixWithCustomAction.msi will be created. If we run it WixWithCustomAction folder will be created in program files with Dummy.txt file inside. Now we just need to call this custom action from the installer. To do this we will add a reference to this project in the setup project. 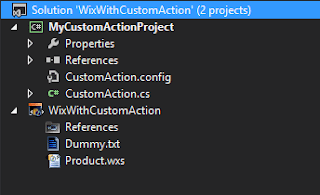 Now let's add the custom action in the Product.wxs file. Adding the project as a reference allows as to use these variables. But adding custom action is a little bit complicated. After building the MyCustomActionProject.dll file we will need a call to MakeSfxCA.exe and sfxca.dll in your installed WiX toolset as the dll need a reference to Microsoft.Deployment.WindowsInstaller.dll and has CustomAction.config attached. 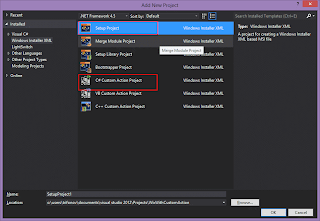 Calling the MakeSfxCA.exe tool will package the project output to MyCustomActionProject.CA.dll(here you can find some additional information about this). 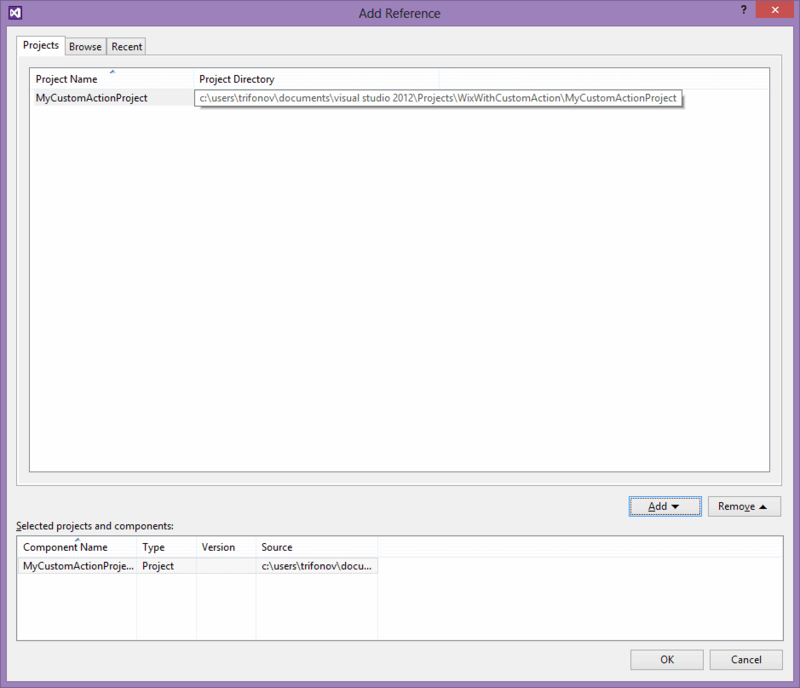 The other option is not to use the project reference but add the full path to the custom action output. The Execute attribute will specify the deferred status of our custom action. And that's it. Now if we build the setup project and run the created msi installer, c:\temp\installed.txt will be created as a part of the installation process. Building a software product - what's one of the secret ingredients?